Has your child ever been excluded or mistreated because he was different from the powerful insiders at school? If so, he’s not alone. Research shows that highly creative students with learning differences are far more likely to be excluded or teased than other students. As if being singled out isn’t bad enough, the majority of these kids don’t know how to respond effectively when they find themselves the victims of verbal abuse or rude treatment. 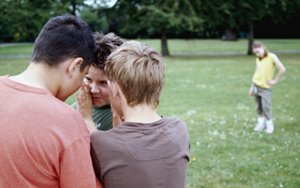 While you may not be able to prevent all harassment, there are actions you can take that will help empower your child to manage and minimize teasing, bullying, and being ostracized by others. Be supportive. Make sure your child has the support and teamwork he deserves. Although his first inclination may be to lash out at those who are part of a group that is being snobby, rude, or verbally abusive, studies show it’s extremely awkward and usually ineffective for children to try to handle those situations on their own. Seek help. If the verbal abuse continues, your child must ask for support from a teacher, counselor, staff member, parent, or other person in authority. Change the culture. Studies show the most effective antidote to nasty, cliquish behavior is a systematic, school-wide, consistently reinforced “Zero Tolerance” policy for verbal abuse. Being an advocate for such a policy in your child’s school can have an impact that goes well beyond his tenure there. Build healthy relationships. Encourage your child to stop seeking clique membership and, instead, build healthy relationships with others who share his interests. Rather than focusing on the unpleasant individuals who are acting snobby or gossiping, it will be empowering for your child to realize she doesn’t need those mean girls to be her friends. With a young child, start by setting up a playdate with someone you know who has similar interests or hobbies. For an older child, offer the opportunity to get together for a fun activity. Think about the movies, plays, music events, video games, amusement parks, creative projects, or outdoor adventures that bring out your child’s best qualities, then make a list of open-minded kids who enjoy those same activities. Reach out one at a time until there are one or more events your child can look forward to in the coming weeks. Change perspective. Instead of waiting anxiously for the popular group to start including her, reframe the high-status clique as a suspect group of anxious strivers who feel good about themselves only when they are teasing or excluding others. By setting up a few one-on-one or small group successes with those who are not required to swear allegiance to the most unfriendly kids at school, your child will build reliable and long-lasting friendships. Provide context. Help your child to recognize that the most innovative, creative, and successful individuals also were excluded from cliques during their school years. If you study the early years of many great entrepreneurs and artists such as Bill Gates (Microsoft), Macy Gray (singer-songwriter), Antonio Villaraigosa (former Los Angeles mayor), Charles Schwab (finance entrepreneur), Robert Rauschenberg (artist), Elisabeth Kubler-Ross (holistic medicine), Bernie Mac, Dustin Hoffman, Edward James Olmos, and Keira Knightley (actors with LD), and Betty Friedan (the founder of the women’s equality movement), you will find that they too were excluded from the popular cliques at their schools because they were “different” and unable to fit in. Yet these resilient and persistent individuals achieved great success as adults and impacted the world in positive ways because they were able to turn their unique outsider perspective into an asset. Point out those lessons to your child and suggest that instead of berating himself for not easily fitting in with the narrow-minded cliques, the experience of being an insightful outsider and a true original is preparing him to do something important later in life. Recruit a go-to person. Help your child seek out a mentor, friend or family member other than you who will consistently remind her of her strengths and unique gifts. Have her check in weekly or monthly for a conversation by phone, email or in person with someone who truly understands the progress she is making and can talk to her about her assets and interests. The simple act of sending out this private message to someone she can trust will begin the healing process. Then when her knowledgeable mentor, friend, or family member offers details about why they prefer your child’s strengths and good qualities over the cruelty and pettiness of the clique members, she will be able to get back on track toward achieving her goals and dreams. Leonard Felder, PhD is a licensed psychologist and the author of numerous books, including Fitting In Is Overrated: The Survival Guide for Anyone Who Has Ever Felt Like an Outsider. Felder is also the parent of a son with learning difficulties.